It has come to the League’s attention that several of our baseball families’ car tires were vandalized sometime on Saturday, April 13 while parked in the residential streets marked with "No Non-Resident Parking" signs near the Pinto field. La Jolla Youth Baseball asks that you respect the residents in the area and comply with the “No Non-Resident Parking” signs. We are looking into the vandalism that occurred so that we can avoid this problem in the future. If you have any issues or questions please email us at . UCSD Tritons Baseball Camps, Clinics, Lessons for 2019 Season! Weekly Baseball Clinics - Tuesday Nights from 6:30 pm to 7:30 pm at Triton Ballpark. No sign-up required. Just show up and work on your baseball skills. They will alternate between hitting and pitching drills one week and hitting and fielding the next week. Clinics run through May! Private and group lessons are available from the coaches at UCSD. Email Matt Harvey at to set up your first lesson! Summer Baseball Camp at UCSD - The Tritons baseball program will be holding summer camps July 8-12, July 15-19, July 22-26 and July 29-August 2. For details and registration go their camp website by clicking HERE. Family, multi-camp and early bird discounts are available! Padres 2019 Summer Camp in La Jolla! 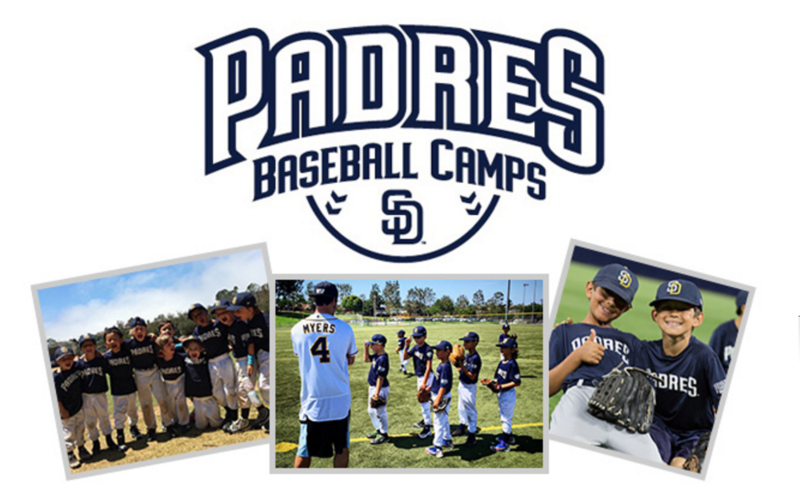 San Diego Padres Baseball Camps will be hosting weeklong camps throughout the San Diego region this summer (including June 17-21 in La Jolla), and they are giving friends and family of La Jolla Youth Baseball an Exclusive $80 discount on the cost of enrollment good until March 1st. If you have any questions, please don’t hesitate to contact Padres Baseball Camps via telephone (619-213-1600) or email ( ). If you want to change roster/contact information, including nickname, phone number, add email addresses, etc., you will need to access your "member profile." You can do that be selecting "Edit My Account" at the bottom of the blue vertical menu bar on the left side of the website. Just type in your email address and the site will send you a password to edit contact contact information. Any questions, contact us at: . Note also that all member profiles have a default to be notified about an upcoming game or practice. Several families have already commented that they appreciate this feature. But, if you no longer wish to receive these notifications, you can toggle them off at your member profile as well. You can also toggle on to have text reminders delivered to your mobile.